It’s not easy to make a children’s film. It’s not easy to do anything with or for children (parents, I can see you nodding in the back there) because of the sheer breadth of childhood experience that is out there. Articulating a story is easy when it’s for yourself; articulating a story that reaches out to others and hits something within them, that’s hard.And when you’re adapting something from a book, it gets even harder. Do you adapt your reading of the book or do you try and broaden the experience? Do you keep the bits you love or do you drop them when somebody else gives you negative feedback? How do you find the space for your story within a very successful other story? Shall I tell you what you do, oh mystical implied other? You watch Paddington, that’s what you do, and you realise that this is probably the best movie out there (ever) that’s been adapted from a children’s book and then you hang up your socks and do something else because nothing you ever do will beat this pure and wonderful and loved piece of work. Paddington is a joy. Adapted from Michael Bond’s Paddington books in which a small bear from Darkest Peru comes to London, the film is pretty much perfect. I don’t say that lightly and indeed, I didn’t expect it to be. You come to these movies with an awareness of the potential for failure. For every Paddington, there’s a Golden Compass or a Narnia; films which take these great swathes of wonderful literature and transform them into something a bit, well, awful. Paddington defies that because it is a film which doesn’t underestimate its audience. Driven by a strong sense of magical realism, this London teeters on the edge of the fantastic and revels in it. Candy coloured houses, preternaturally present pigeons (one of the best running gags in the films), bands playing in the street, and characters who don’t bat an eyelid at a bear walking down the street. There are references back to evacuated children, touching on one of the great themes at the heart of Paddington, and this drives one of the most wonderful and heartwrenching sequences of the film (underpinned by a lovely and incredibly potent turn from Jim Broadbent). It’s smart film-making, and it’s brave and it’s innovative and it’s challenging. Scenes shift on a dime, leaves fall from a painted tree to signify the shift in the seasons, and I’ve never seen Paddington station look so wonderful. It’s easy to neglect the background in a film like this, but this is painterly space; landscape which tells the story as much as the spoken word does.This is a film which delivers slapstick and social commentary all in the same breath, alongside some of the best looking marmalade I’ve ever seen. It’s been a while since I’ve reviewed a film on this blog, and a lot of that’s driven from a slight malaise. I’ve not seen a film for a long time that has had me marked with love for it from the get go; there are moments, always, within every film, but it has been too long since I have been left breathless with love for something. Paddington is perfect. It really, really is. A 2009 Spike Jonze film, and a 1963 picture book classic may not seem the closest of relations, but they are. 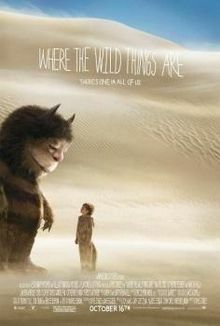 Jonze’s live-action adaptation of Maurice Sendak’s superb ‘Where The Wild Things Are’ was released in 2009. The book and the film form the second of my combined book and movie reviews (the first was a look at The Black Stallion). The book itself is one of those big picture books that, with a mastery of economy and a subtle lightness of touch, expresses a pivotal moment in a boys life. This is what happens when Max throws a tantrum. He is sent to his room where suddenly a forest start to grow and he is transported to the island where the wild things live. Max becomes their King, before eventually missing home and sailing back home in time for his still hot supper. That’s a very bald synopsis for a very complex and rich book. Some of the finest parts of it contain no words and show the ‘wild rumpus’ on the island being enjoyed by both the wild things and Max. These are pictures full of an exuberant and glory-filled wildness. It’s a book that has shifted into iconic status, and rightly so. What I personally love about it is that Sendak allows Max to rage against the injustices of his life. His fury is legitimate. Max will not go quietly into that dark night. He is allowed to be angry, to be fiery, to be unreasonable, and yet to also gain a sense of self and to grow. It’s a fine, fine balance to achieve in a book and an even finer achievement when one considers the relative brevity of a picture book. Adapting this book into a film would always rely heavily on Max. He needs to be furious and endearing, complicated and naive, brave and scared. He needs to be everything when he needs to be, and nothing when he doesn’t. And Max Records, the actor cast to play him, delivers superbly. When he’s still, his eyes tell everything, and when he’s caught in fury, his body expresses his rage. Wholly. He’s an all or nothing sort of actor, and delivers without an inch of self-consciousness. I loved him. I fell in love with him in the opening sequence, practically instantly, when he caught that subtle moment of having fun and then suddenly it all goes too far and somebody gets hurt. What’s also pleasing is that one of the other pivotal roles, Max’s mother, is equally astutely cast. My beloved Catherine Keener takes the role, and brings to it a lovely sense of warmth and sympathy. I also had a bit of a moment at the sight of Percy Jackson’s mother chatting to the Incredible Hulk and briefly entertained the thought of an epic crossover between the two franchises. On a personal level, I had some severe doubts at hearing the Wild Things actually speak, and the accents they spoke in, but a lot of that relates to them being book characters in the first place. When you read books, you read them in your own voice and so I imprinted my perceptions onto these monsters. It did grate initially but I barely noticed it after ten minutes or so. There is a lot of love in this film, from the quite beautiful and subtle soundtrack (Karen O) to the warm and potent script (Jonze & Dave Eggers). Jonze shoots this film with an epic sense of romance, allowing the camera to dwell for long beats on sunshine drenched frames and beautifully staged moments. The final beat of the film is particularly potent. I also enjoyed that there was a lot of respect for the source text; shapes and colours and elements from the book were brought to the film’s visual identity with wit and grace. The transition to film perhaps pulls the story slightly into a more adult perspective, what with the careful construction of the Wild Things who slowly pull and question Max to facilitate his development. It’s vaguely reminiscent of a Woody Allen film at parts, but as a whole, this film is a languid, subtle experience and one that, when the dark moments come, hits you very hard. There’s such tension here, and such beauty, even in the anger and sadness. Where The Wild Things Are is an utter gem. It’s a stunning book, and a valuable, elegant and beautiful film. The Eagle is a 2011 adaptation of Rosemary Sutcliff’s definitive historical classic ‘The Eagle of the Ninth’. Directed by Kevin Macdonald (The Last King of Scotland and Touching The Void amongst others), The Eagle tells the story of Marcus Aquila and how he discovers what happened to his father’s legion – the Ninth – which was lost (Eagle and all) in mysterious circumstances North of the border. Channing Tatum (whom I last saw in Step Up – yes, the dance movie is my friend) acquits himself solidly as young centurion Marcus. His phenomenally huge neck (seriously, it’s MASSIVE) is only mildly distracting as he starts his new command at a garrison. He’s a big, muscle-packed dude who seems haunted by what happened to his father. It’s an interesting mix and one that comes across well in the opening act of the movie. Due to circumstances, Marcus finds himself invalided out of the army and is forced to spend some time at wicked-eyed Uncle Donald Sutherland’s house. I love Sutherland. Please can we have a spin-off with him as a Roman? It would be brilliant. Marcus manages to end up with a new slave Esca; the enigmatic and distinctly aesthetically pleasing Jamie Bell (probably best known for Billy Elliott – again, yes, the dance movie is a genre I know well). There’s a little bit more of Tatum-Trauma (“My Daddy, my daddy”) before him and Bell head North to restore the reputation of Channing’s pop and the legion, yo. The Eagle is great but the accent issue is ridiculously distracting. It’s perhaps best described as John Wayne does Gladiator. It becomes so glaring that it’s impossible to ignore. Donald Sutherland seems so gorgeously amused by the whole thing (“I’m doing period? Get out!”) I’m willing to forgive him, but the moments in the deepest darkest North are a little bit harder to stomach. The Eagle reaches a lot deeper in the book than perhaps it was allowed or able to reach in this adaptation. Issues such as honour, and the fractured nature of Britain at that time, are fascinating and worthy of greater attention. We also lose a lot of the rationale behind Esca’s actions which makes his support for Marcus’ actions come across as a bit, well, random. The Eagle is a perfect Sunday afternoon movie after you’ve had a huge roast. Do note however that if watching with children, there’s violence and a fairly obvious beheading scene. There’s also a graphic scene involving implied violence to a child. It’s rated 12 and if you have sensitive youngsters, I would suggest discretion would be the better part of valour regarding this.